(Oh meine) Liebe auf den ersten Blick. Des Moines gives, and Des Moines takes away. Right after the small but passionate audience at Love Is All's Vaudeville Mews show Thursday night had me only praising the Des Moines concert experience, a couple of other (pretty good!) shows by bands I basically like taught me a couple of the more awkward quirks of a smaller city's music scene. Aside from not many of my friends wanting to go to a midnight show on a weeknight, I mean. Dum Dum Girls first. This buzzing, reverb-buried garage-pop band-- on stage sort of like if the models from the "Addicted to Love" video wanted to be the Strokes-- began as the solo project of a supposed Los Angeles librarian calling herself Dee Dee (real name: Kristin Gundred). After the One Kiss Can Lead to Another box set a few years ago coincided with a resurgence of bands inspired by 1960s girl-groups (the Pipettes, Lucky Soul, Tralala, Johnny Boy-- the list goes on), in the past couple of years more female-led bands have taken a rougher, noisier approach to the girl-group genre: Vivian Girls, meet the Shaggs. While Vivian Girls have a great sound, Dum Dum Girls struck me from the start as having the better songs. For one thing, Dee Dee's debut Dum Dum Girls EP could pull off a ballad. For another, tracks like "Catholicked," with clever lines about a chest stuffed with emotion and a confident young woman declaring that "my sins are my own," struck me as simply good pieces of songwriting, however you might choose to record them. I even said so, in a Pitchfork track review, back in February 2009. Dum Dum Girls released their debut album, I Will Be, on indie (well, actually nearly half-owned by Warner) heavyweight Sub Pop, earlier this year. Dee Dee has a full band now, and Richard Gottehrer, who co-wrote "My Boyfriend's Back" and produced the likes of Blondie and the Go-Go's, helped produce. The overall sound is slightly cleaner, and the individual songs didn't quite reveal themselves to me as much, but my overall positive impression about the band definitely pushed the album into steady iPhone duty. Not a surefire top 10, or anything, but easily a contender for a spot on my overall year-end list, on the faith that I'd get more into the individual songs the more I heard them. Which is still quite possible-- it's a good album. Their early show Monday night at the Mews, however, was... weird. 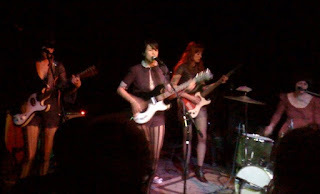 First of all, Dum Dum Girls are opening pretty much everywhere else for San Francisco buzz band Girls. I'm pretty sure I saw Christopher Owens, the dude from Girls with the awesome backstory (I'll let you Google it for yourself), in the audience last night. But I guess his band chose not to play Des Moines that particular evening? Which-- fair play, totally his right. So it was just Dum Dum Girls, who I like better, anyway. And I was looking for Captured Tracks and Blank Dogs man Mike Sniper, who I really enjoyed interviewing for a recent article, and who I think used to tour as a member of Dum Dum Girls, but I guess he wasn't there, either. Whatever. The music itself was great: a little bit of overkill on the reverb, maybe, but Dee Dee's new band sounded super-tight, they did "Catholicked" and "Bhang Bhang, I'm a Burnout" and anything else I was expecting to hear, and I was nodding my head and bouncing up and down and looking stupid. Except for the "stupid" part, so were a lot of people. The crowd was a little dude-heavy, but the dudes couldn't help that, and neither could the Girls (Dum Dum or otherwise). And, you know, if you really are the Strokes, and it's, let's say, 2001, then yeah, you can play a super-short set-- I'm gonna be generous and guess it was 30 minutes?-- and address the audience with a totally supercilious attitude (I think we got a "thank you" or two, tops) and then be all the cooler for it. But it's 2010! And Dum Dum Girls are good, but they're not that great! And the stockings, or pantyhose, or whatever you call those retrograde comic-book-fantasy outfits they were wearing-- they're another reason to listen to Robyn or Beyonce or Kate Nash. I was gonna ask Dee Dee if they brought records or tapes I could buy, but I was too scared. Somebody else asked. We could order them online, I heard. Whatever, it's only Des Moines, right? Bummer. I have less to say about the Morning Benders' show at the Mews on Friday night, I promise. They're another buzzed-about band, this time from Berkeley, California. Their new album is called Big Echo, and you might like it if you're into bands like the Shins or the Dodos. The catchiest song, "Excuses," combines elements of, like, college a cappella groups (you will never get the "bum bah bum" out of your head) and precious, melodic indie-rock. It also has a lyric about "the southern tip of your body," which, I'm sorry. Anyway, I went to the show with a bunch of friends, and I had a good time, and I'm really glad Morning Benders came to Des Moines. It might've been the overall vibe, I dunno, but I was starting to find the show itself a little boring, a little bit the kind of thing where the noisy spots felt tacked on for the cool factor when the underlying songs really wanted to be something a little cleaner, a little more pop/rock. Which, if you know me, is fine, too! But I was armed with Twitter, and I had the misimpression I was about to be clever-- always dangerous-- so I tweeted something snarky. The next day, also on Twitter, Christopher from the band understandably called me out. I apologized profusely, immediately, and will do so again if called, because either way they seem like really nice guys, and even if they weren't it sounds like they felt it was just a strange night, and besides, the whole point of music criticism for me is never to start a personal beef with an artist or go out of my way to hurt their feelings; you're supposed to be providing a service for other people, not virtually heckling the band. I screwed up. It's interesting, though. The rules are probably different because I'm a music critic, and so, like it or not, I'm a representative of the publications I write for. But I wonder if, in Brooklyn, there would've been so many tweets that maybe my own boneheaded attempts at humor could've gone overlooked, unnoticed, and un-called-out, so Morning Benders wouldn't have had to try to figure out what I was saying (it doesn't really make sense) and I would've been in the clear. A learning experience: In a smaller city, it's harder to blend in, even when you say something online. I'd better get smart. THIS IS WONDERFUL! If im going to miss these 2 shows Im glad I can still get the goods thanks for this Marc! Yeah, I know what you mean about the Dum Dum Girls ahow leaving a slightly weird aftertaste. I too was perplexed by the lack of any merch...I can't remember ever seeing a band that was too cool to sell merch! But overall the performance was good, and that was Christopher from Girls in the audience. I talked to him about Suede for a bit, it's always nice to run into another Anglophile. BTW, you should go to the Canby release show on the first of May...Golden Veins (my band, formerly Beati Paoli) is playing our first show. Will surely be awkward, but it's sure to be historic(?)! Regarding the "Love Is All" show - small and enthusiastic crowds are always better than large ones. I'll never forget seeing Deke Dickerson at the Mews and feeling like I was there with 20 of his personal friends that he visits every time he's in Iowa. Whether at VM or Prairie Meadows or Meskwaki. "In a smaller city, it's harder to blend in, even when you say something online." That's the beauty of this place. If you want to blend in, there are plenty of insurance jobs in this town. But for me I'm interested in the authentic people who don't blend. And in Des Moines I can see them up close. I found the Morning Benders show to be fine. For the price I paid to see a subsequently-hyped-in-the-Sunday-NYT band, along with Miniature Tigers (who's stage presence I enjoyed more), it was well worth it. Call me a "value" show goer. In general I've found the early and late show schedules at VM to be a pain. Are we at a point where we need an additional venue in town to distribute the show load? The 5pm shows are way too early and often have another musician playing at 10pm. And I've been to 10pm shows where the main act doesn't come on stage until after midnight and then only plays for 30 minutes - ughh. Yeah, Mike, I should have mentioned the price! Ten bucks! Really great value. I don't know if we're ready for two venues, money-wise, but I hear ya about the difficulties keeping track of the times. I don't mind the early shows so much because it usually means the headliner is on by 8 p.m. and I can drag Mrs. Des Noise along. But yeah, waiting until midnight for a half-hour shows (which I don't think has happened to me yet here) is just a drag. Then again, we're pretty spoiled there, too, because both early and late shows at least do usually start pretty promptly, and we get some pretty good bands through town... it's not like trekking out to East Williamsburg for some 3 a.m. show or something (which I didn't do, either, fwiw!). Gregory, sorry we missed each other at Dum Dum Girls! I saw you there at one of the tables when I had already walked up to the front, and I think we were both talking to people, and then I didn't see you again. Cool to hear about Christopher from Girls. Suede! Funny how Bernard Butler is all over the place these days producing stuff. And yeah, that May 1 show sounds great-- really dig Canby, and would love to see your new band. I'll edit the post and add that. Thanks for the heads up! Cool, the post is edited-- I was lazy last night and hadn't checked the local concert websites... just added a ton of stuff-- so please let me know if I'm still missing anything. I mostly agree with you on these two shows (although I saw the Morning Benders in Ames because I could get in for free). 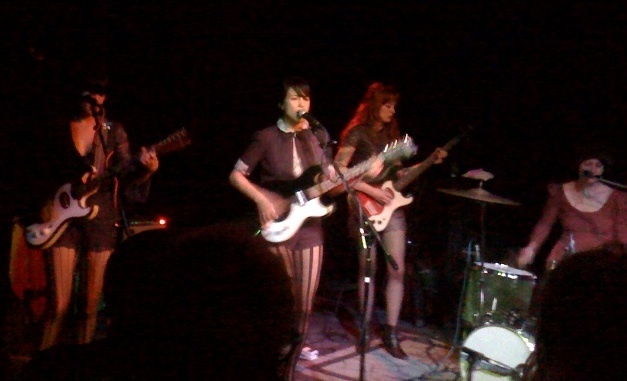 While I like Dum Dum Girls for their two-minute pop songs, it is hard to be satisfied when I show up just in time to miss the two openers, pay $10, and walk out of the venue 40 minutes later. I didn't specifically look at the merch, but when I glanced over it, the table did look empty. So, it could be said that the music was good, the show was not, if that is possible. The Morning Benders show in Ames was a bit weird as well. I had heard about this band from various places but had not given them a listen yet. It sounded very alright, and my favorite part ended up being the (probably) improvised mess of feedback and vocal loops that they ended their show with. However, the members of the band seemed very friendly both on and off stage, which is always nice to see. Thank you for the kind words! Glad to hear my impressions weren't too far off base. Morning Benders do seem really really nice, which is awesome. Just wish I had been able to pick up a Dum Dum Girls cassette! Anyway, hope to see you around one of these days. Thanks again! Sorry the blog is such a mess most of the time-- it's fun to do, though.